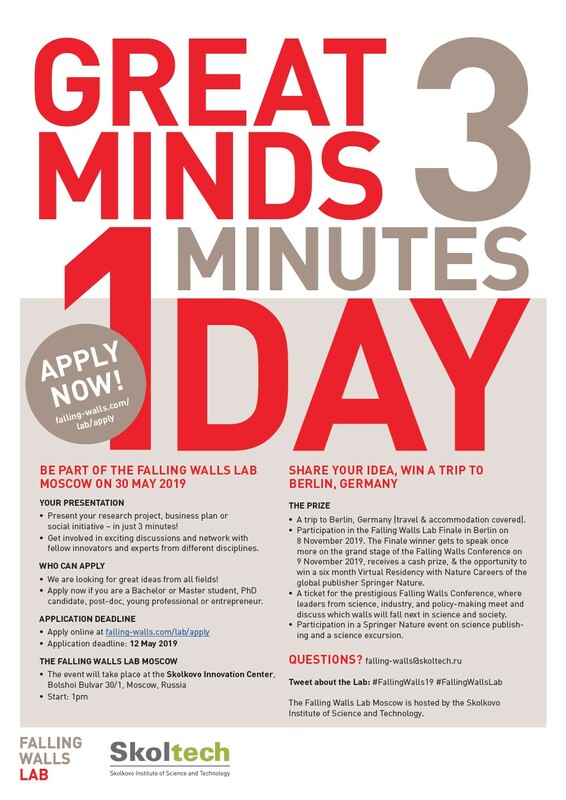 Falling Walls Lab Moscow offers young innovators and academics the opportunity to present their research projects to an illustrious panel of jurors for the chance to win a trip to Berlin. The catch? You have to wow the jury in three minutes or less. Skoltech is pleased to announce an open call for applications to participate in Falling Walls Lab Moscow 2019. This year Skoltech will host Falling Walls Lab Moscow within the framework of the Startup Village 2019. We are seeking outstanding talents and innovators with high potentials from various academic fields. To get involved, apply online at http://msc.skoltech.ru/falling-walls-lab until May 12, 2019. The final selection will take place at Skoltech on May 30, 2019.